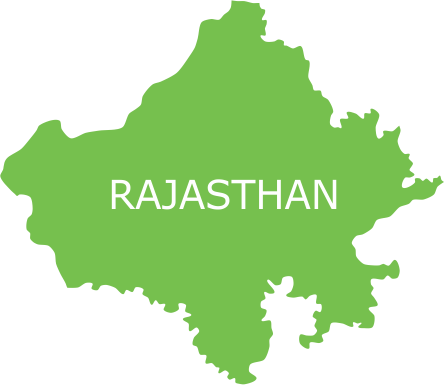 Rajasthan – the largest state in India in terms of land area is home to 68 million people. 17% of the total population of the state resides in Jaipur, the state capital. As per the latest census report, more than 7 lakh people in the city live below the poverty line. There are as many as 250 slums in the district with more than 60,000 households. Majority of the slum clusters are located on the outskirts that include forestlands and flood prone areas. The residents have poor living conditions with inadequate availability of water and sanitation facilities, and overcrowding. The excess in the urban poor population has created a gap in delivery of healthcare services to the underserved children and families. Among the slum dwellers, communicable diseases such as tuberculosis and malaria get easily spread due to ignorance of health-seeking behaviour. Despite the presence of a good network of public and private healthcare facilities, addressing the growing demand of the health needs of the underprivileged section of the city is a big challenge. Moreover, with majority of the slum population surviving on a very low annual income, spending on healthcare services becomes a big concern for the families. In order to take care of the healthcare needs of the underprivileged population, Smile Foundation intervened and launched a Smile on Wheels project in Jaipur. The project being implemented was initiated in 2010 in partnership with Shikshit Rojgar Kendra Prabandhak Samiti (SRKPS). The primary objective of the project is to provide basic promotive, curative and preventive healthcare facilities to the inhabitants. Through a mobile hospital that is fitted with all the necessary medical equipment and staffed with medical experts, the project is also into spreading awareness and inculcating health-seeking behaviour in areas that lacked a proper healthcare system. The project has been able to bring a positive change among the families in the slum communities. It has been able to sensitize children and the families of the slum clusters, who earlier were reluctant to even attend the awareness programmes that are conducted from time to time. It now reaches out to a significant population, educating them on issues pertaining to diseases like malaria, swine flu, polio awareness and more. Well-equipped mobile hospital launched in 2010 provides promotive, preventive and curative healthcare services to residents of 22 urban slums of Jaipur. The mobile hospital unit visits 6 main slums of the Jaipur district, namely Kalakar, Bhatta, Jagatpura, Jhalana, Bagrana and Idgah, twice every week. It covers 16 more slum areas by organizing a special health camp every Sunday. Spreading awareness about healthcare issues through various IEC (Information, Education and Communication) campaigns in the slums. Awareness programmes covered a wide range of topics, ranging from specific diseases to important issues like reproductive health in women. Rallies, counselling programmes and blood donation camps also organised. Strong links with the government health officials and NRHM created, resulting in easy access to medicines, family planning products and IEC materials, further augmenting the project’s reach to beneficiaries.